Designed for high capacities and incredibly accurate sorting, the SSM is the top specification small products sorter from Satake. New features include real image acquisition, bullseye targeting of defects, advanced flow rate control parameters and internet connectivity. 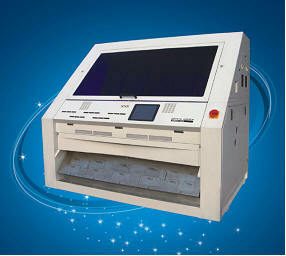 The SSM Series sorter is a new concept from the ground up. Available in three chute and five chute models (which can also be split in to smaller sub-chutes) the SSM is for high capacity sorting. The SSM5001 model has a total of 420 ejectors! Sorting technology uses a fully digital CCD package for monochromatic sorting on AIS models, or for added foreign material removal performance, the AMS model also has multiple NIR cameras for a bichromatic sort. The use of real image acquisition allows the SSM to determine the size, shape and trajectory of the product to which the defect is attached. The SSM calculates the centre point of the product to accurately fire the ejector precisely at its centre, rather than at the defect itself, which in conventional sorters can just spin the product instead of rejecting it The SSM will even fire two adjacent ejectors simultaneously if it detects that the product will fall directly between the two firing points. Parameters can be easily set in to the SSM’s large touch screen and saved to a 100 product memory for retrievable and easy product changes. 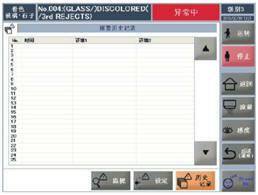 For normal operation, all the information about the machine’s functions are displayed on the easy to read screen. This includes data such as buffer hopper status, flow rate, trip levels and any alarm conditions. Graphs and data for individual ejector performance can be recalled and studied. 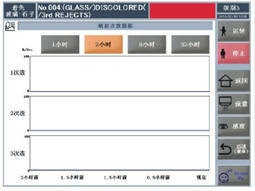 This allows later monitoring of unmanned shift conditions or analysis of the effect of product and parameter changes. All alarm conditions and all changes made to the machine’s parameters are logged for management and performance review.